As the housing crisis continues and demand for housing declines as people move in with friends and relatives, now is a fantastic time to negotiate for lower rent in some markets. 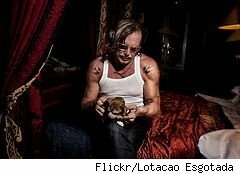 Just ask actor Mickey Rourke. He just rented a loft in Manhattan's Meatpacking district for $19,800 per month. That might sound like a pretty hefty rent payment. But consider this. The Wall Street Journalreports (subscription required) that "The 5,000-square-foot loft has a private keyed elevator, four bedrooms, a media room and three baths. The full-floor apartment has blonde oak floors throughout and a sauna. A former tenant had rented the same apartment four months ago for $40,000 per month, says listing agent Frances Katzen of Prudential Douglas Elliman." That's a discount of just more than 50% compared with what a tenant was paying just four months ago in a market that, for all the turmoil, still has one of the lowest vacancy rates in the country. Rourke may have benefited from the number of suddenly feeling poor wealthy people who are trading down to less expensive properties. Just as high-end homes have fallen in value much more than lower-end properties during this mess, the same thing may be going on with rentals. That means that, if you have the money, now may be a great time to score a deal on a nicer place than you used to be able to afford. But more importantly -- with the exception of a few anomalies -- sales prices have fallen much, much farther than rental rates. That, combined with low interest rates, mean that you'd be much better off telling your landlord you bought a house than trying to negotiate for a lower rent.